Lee Hartley (Fylde Croquet Club) Won the David Openshaw Claret Jug. We were lucky to have thirteen entries this year. Apart from the opening of play each day, thirteen allowed for very little sitting out. Sunshine, no breeze, tight hoops. Good to see many returning players who have had time out with injury including Dave Nick and Lee Hartley who both added to their TP tallies. The only problem was how to award three equally weighted trophies at the end of the tournament given the usual demands of flexibility and voracious game appetites – Paul Hands to the rescue (CROQUET, January 1990, Issue No. 207, pp 26-27). So it ran as a KO plus a combined F4 & F5 with the modification that every game was equally weighted. We had the luxury of no time limits which was well received by everyone. Several two and three ball endings were played out which may have otherwise been time affected. 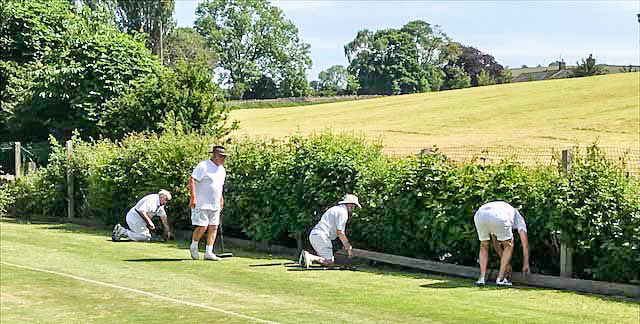 With the favourable conditions everyone took all the croquet games they could get, being ‘ready to play’ straight away. At least that is until after lunch on Sunday. At that point some players quite correctly took advantage of the ‘resting’ slot to see how things might unfold (or had they simply seen the weather forecast?). 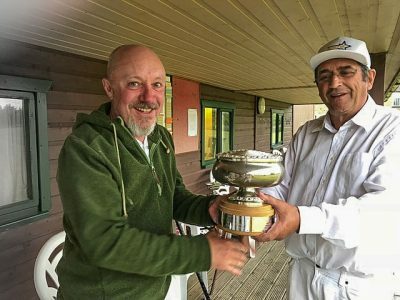 However the Jeremy Dyer Trophy Winner Chris Martin (Meadows Croquet Club) took a brave gamble and opted to be ready to play although his next opponent would be a minus player. Winning that game in fine style secured the trophy. Well played. With only a few final games in play, a sudden and heavy thunder storm brought many of the non critical games to an abandoned end. 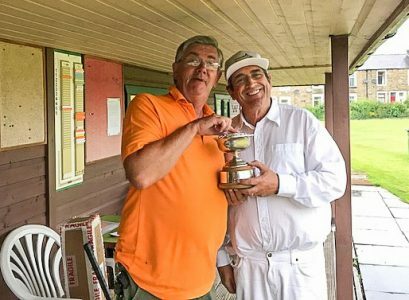 The Chris Clarke Trophy went to Paul Rigge (Pendle & Craven Croquet Club) this was intended and fulfilled for the best handicap 1 or below performance but fittingly could also double as the KO runner up. 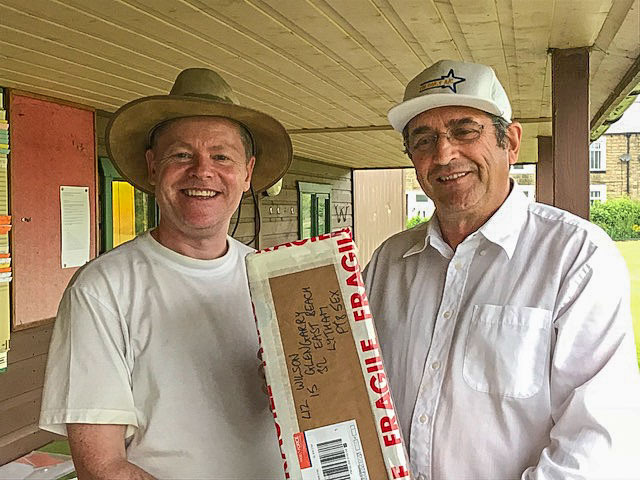 Photo narrative: Having been diligently returned from the Uruguayan Embassy Croquet Department The manager Peter Wilson presented the beautiful David Openshaw Claret Jug to Lee Hartley from Fylde Croquet. A very enjoyable / informative / interesting report. Well done for taking the time to compose it.